Anyone familiar with the PIC revolver? I saw one at a pawn shop a few days ago. It said PIC Decatur GA and underneath that it said Made In Italy. The gun wasn't working correctly and the pawnbroker said he'd sell it to me for a song. I'm not into buying guns right now, but I might go back and pick it up if its still there in a month or two. I've gotta pay the property taxes on my vehicles before I spend any money on fun stuff. You guys know the drill. The only way I got to see it was by asking the pawnbroker if he had anything that I collect, like SNS guns. The pawnbroker said that he kept "that kind of gun" in the back as they seem to attract the type of potential buyers that get put on delay, in research, or just flat out denied during the background check process and wind up just wasting everyone's time because the sale doesn't go through. The pawnbroker showed me a used Hi Point CF380 along with the little PIC revolver. He told me he paid next to nothing for the PIC since it was in non-working condition but the person who brought it in just didn't want the gun. The pawnbroker did nicely say to me that any time I come back and buy a gun from him (any gun), he'll just throw in that little PIC revolver. What a deal! Does anyone know anything about these guns? I remember researching them years ago and didn't find much. What would I ever do for parts? I've seen them listed on Gunbroker from time to time, but that's about all I got, sorry. Is this it??? Looks like a right opening cylinder yoke. Nah, that's not like the one that I saw but it is very interesting. 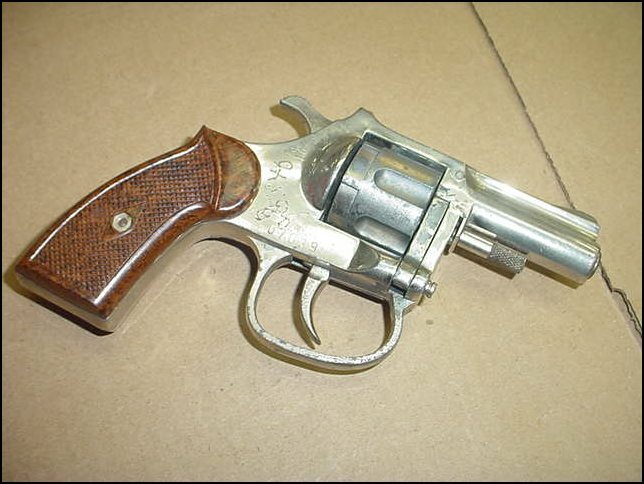 A truly left-handed revolver like the one made by Charter Arms. The one you pictured looks more like a warmed over Clerke First.